India is home to a rich cultural heritage, ancient history, fantastic engineering that leaves historians puzzled even today. Visiting some of the majestic forts in India is the best way to experience the regal lineage of the country. Even though Rajas and Maharajas have built these incredible structures centuries ago, they still stand and retain their beauty and mystique today. Forts were strongholds, bastions that many had to conquer to vanquish other kings. Made up in a fabulous way with latticework, grand montages, and plenty of murals, you can’t help but fall in love with these spectacular architectural structures India is so delighted about. Considering there are so many forts in India, Kesari Tours collated a list of famous forts of India that are worth a visit. Get a glimpse of incredible Mughal architecture on your visit to Delhi’s Red Fort, recognized as one of the world-renowned historical forts in India. Ustad Ahmad Lahori, a famous architect with his fellows built the fort with an enclosed red sandstone wall and so, it was named The Red Fort. Listed in the UNESCO World Heritage Sites, this historic structure highlights a glimpse of Islamic architectural sensibilities, along with other strong elements borrowed from Persian, Timurid and Hindu architectural styles. 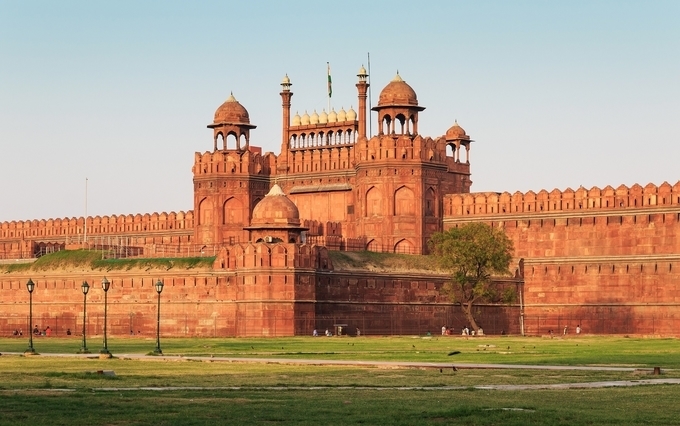 The best time to visit Red Fort is between October and March. 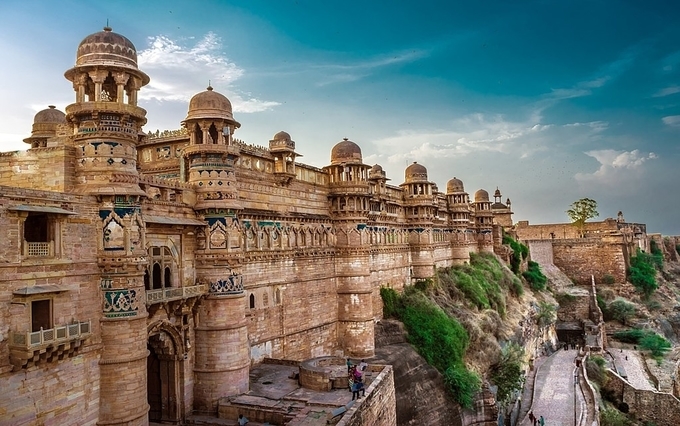 The Gwalior Fort built by the local king Suraj Sen is majestic of all forts in India. The historical significance of the fort is that Rani Lakshmi Bai breathed her last after fighting hard with British rulers. Even the historical structure highlights a perfect combination of aesthetically painted walls with military styled architecture, with a royal blue colour in its carvings. To get an ultimate experience on your visit to the Gwalior Fort, you must visit any time from October to March when the weather is just right; not too hot nor cold. Soak yourself in the immense Rajput and Mughal architectural styles in the fort that has seen the reign of famous dynasties, like the Rana Jats, Mughals, Suris and Marathas. Do not forget to look at the prime attractions of the fort i.e. Gujari Mahal, Man Mandir and Sas Bahu temple. Originally called Golla Konda, i.e. 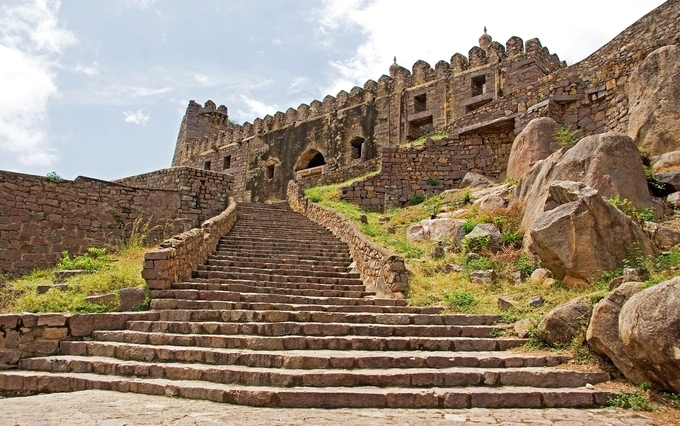 Shepherd’s Hill, the Golconda Fort in Telangana is one of the most renowned historical buildings in India. It was also a significant diamond trade centre, where the Hope and Kohinoor were some renowned diamonds mined here. This fort is a complex of four forts enclosed by a long outer wall of 10 kilometers with 4 drawbridges, 8 gateways and more than 80 semicircular strongholds. Intricately designed pillars, domes, royal apartments, temples, mosques and entrances are major delights to explore here. Furthermore, engineering marvels hidden in the nooks of the fort are interesting features to explore in one of these well-known forts of India. Do not miss the unbelievable acoustic effect of the nearby Fateh Darwaza and Bala Hisar pavilion nearly a kilometre away. The best time to visit Golconda is during the winter months i.e. from November to February to explore the fort at your leisure. Jaisalmer Fort, known as the Golden Fort is one of the largest old forts in India built by the famous architect Rawal Jaisal of that time. This 12th-century fort was voted one of the best forts in India by thousands of tourists. What makes is so special is the fact that the architects designed the architectural marvel without water. The spectacular Jaisalmer Fort is 1500 ft long, 750 ft wide and 250 ft high on a hill overlooking the countryside, which can tell you the importance of forts in India. Make sure to explore the fort’s basement consisting of tall walls that form a double defence line and its bastions form a 30 feet chain. It is perhaps one of the only desert forts in India where people still live inside the fort complex. 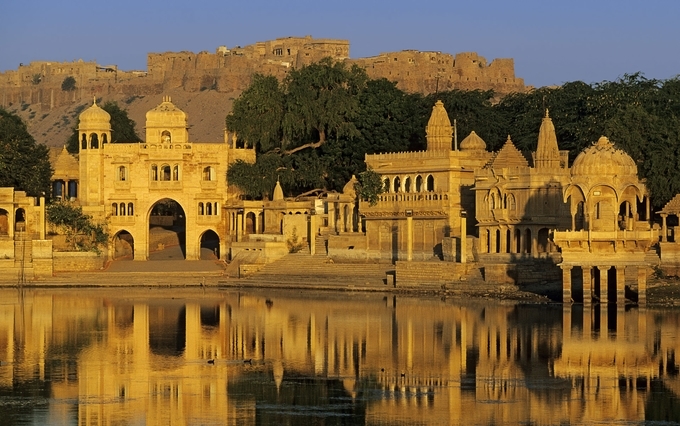 To make your tour to Jaisalmer Fort memorable, visit during the winter months i.e. November to February when the weather is not too hot. If you find your interest piqued connect with Kesari Tours to get more information before you book a holiday.